I was going for muffins with a streusel topping. That didn't work out so well, but they came out like caramel sticky buns, and they were fabulous. I asked my non-GAPS husband if these weren't the "best thing ever", and he replied enthusiastically that yes, the were "the best thing ever!" One problem I had was that the butter from my topping oozed out all over my oven, creating a smoking mess. Partly that's because I only topped half of the buns since my six year old wanted plain banana muffins (so double high topping). Partly it was because the sticky part of sticky buns is actually supposed to be on the bottom (while baking. You flip them onto a tray when they come out of the oven). I am going to cook them that way tomorrow, and I'll let you know how it works out. Mix all ingredients for buns with a wire whisk. Pour into a well-greased muffin tin or use silicone liners (I think paper would stick too much). Mix all ingredients for topping with a fork. Crumble topping on buns. Bake for 20-25 minutes, until cooked through. Cool for about two minutes then immediately remove from muffin tin to a wire rack to finish cooling. You will have to scrape the topping back onto buns as you remove them, but the topping will set-up as they cool. Hot caramel can burn skin badly, so please be careful. Thanks for this recipe! I was planning to make Cinnamon Rolls this weekend and was trying to figure out something special to make for my Gluten Free daughter. This looks perfect! yum!! these are so delicious. thanks for sharing. would love to see postings w/ other coconut flour recipes because i haven't found any good ones. thanks! i was curious how this would be with something other then coconut flour as its sooo expensive here. Yummm. I made these for my daughter, and also took them to a potluck to share with some other Gluten Free friends. Thanks for the recipe! Yes, coconut flour is expensive, but you really use a tiny amount in most recipes, because it is so absorbant. If you are doing GAPS or SCD, you could certainly use almond flour, but the texture will be more grainy. 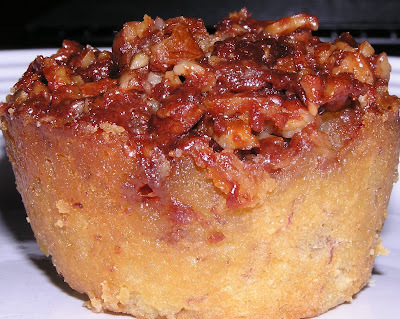 If you are just gluten-free, any gluten-free muffin recipe can be used with this topping. If you substitute flours you will probably have to decrease the eggs and add more flour. I was worried the batter was too thin, so i added a bit more flour, and was still worried, but they turned out great!!!! We can't do dairy, so i subbed coconut oil and bacon fat- YUM!!! Also, didn't have any coconut flour so used bob's gluten free mixture. I am so glad you enjoyed these! Sorry that you had trouble with the topping. One of the tricks is to unmold them while they're still quite warm, but not so hot that the muffin part disintegrates. If you bake them with the topping on top, they turn out with a more "crumb cake" type consistency. It's still a very tasty recipe that way, but not so gooey. Just made it and ate it. I reduced the amount of honey used as my banana was really overripe. Yummy! Thanks! I just made these, and they were awesome! I took the suggestion and put the nut topping on the bottom of the muffin pan, and they came out perfectly. Hardly anything stuck to the pan. Can I substitute something for the banana, we don't like bananas. The were wonderful! Thank for sharing ... I made this with topping on the top not the bottom and everyone loved them. Will try them with topping on the bottom next time. Thanks for sharing such a wonderful recipe that is SCD friendly. Will these save well.? Do they need to be refrigerated or can they sit at room temperature ? I would put them in the refrigerator. They should keep for several days (though we've never made it that long.) In a cool house, I would keep them at room temperature for one day or overnight. If it's hot, I wouldn't keep them out longer than a couple of hours.